Chapter 20 Star Chart: 2026 A.D. Orion took the chain (string of 12 moon-links) in his hand and his key (two-pronged club) and "he laid hold on the dragon (Drago), that old serpent (Serpens), which is the Devil (Hydra), and Satan (Cetus), and bound him a thousand years" (in a red radius line cage) and (Perseus) cast him into the bottomless pit (black MOON) and set "a SEAL upon him" (SUN and MOON in Cetus -- 20:3). "And I saw (lunar) thrones, and they sat upon them, and judgment was (red radius line) given unto them: and I saw the souls of them that were beheaded (with red radius line swords so that we see their lunar necks whose heads are seen in Argo, Orion, Perseus, Taurus, Pegasus, etc.) for the witness of Jesus, and for the word of God (each has a Bible open except the bottomless pit in Aries), and which had not worshipped the beast (Hydra-Leo-Ursa Major-Ursa Minor Holy Roman Empire -- Dan. 7), neither his image (Capricorn Moslem goat -- Dan. 8), neither had received his mark upon their foreheads, or in their hands (star cross; "in the name of Allah" star) ; and they lived and reigned with Christ a thousand years (20:4). If we add 1000° years counter-clockwise (+ 360° + 360° + 280°), we come to 3026 A.D. when Satan is released again to (red radius line) deceive and gather Gog and Magog who compassed the camp of the saints about (Gemini rotates around Ursa Minor -- the little flock). And (red radius line) "fire came down ... and devoured" Gog and Magog (SUN in Gemini -- 20:9) "the number of whom is as the sand of the sea" (Milky Way army). Cepheus sits on the great white throne "from whose face the earth and the heaven fled away (as it rotated 360°); and there was found no place for them" (so they stayed in the same place) (20:11). And I saw the dead, small (Ursa Minor; Canis Minor) and great (Ursa Major; Canis Major) stand before God (Cepheus) and the books (of the Bible -- John 5:45; 12:48) (on round DVDs) were opened (to their understanding -- Isa. 25:7). The 12 moons are "thrones" (20:4) and "books" (20:12) in 30° intervals. The 12 apostles sit on those 12 thrones (Matt. 19:28; 1 Cor. 6:2) that "judged every man according to their WORKS" (not according to mercy or grace or faith) (counter-clockwise indicates a pole-shift has taken place -- Isa. 24:1). Anyone not found in the book of life (Virgo's full MOON open with a red book mark; or the golden sun book in Gemini with red book mark) was (radius red line) "cast into the lake of fire" (20:10,15)(Aries' SOLAR ECLIPSE). The Lamb looks away as evildoers are thrown into this fire, perhaps implying "I never knew you" (Matt. 7:23). 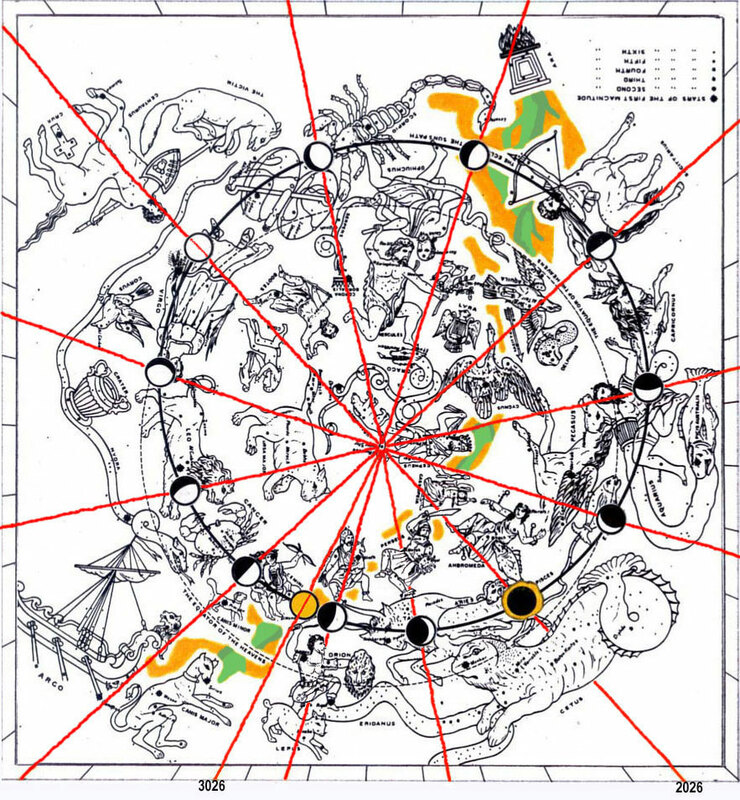 The Zodiac is now white since 12 moons make "no night there" (21:25). "I saw an angel (messenger; Messiah -- Mal. 3:1) come down from heaven (Perseus has wings on his heels as he rotates down to the earth's horizon), having the KEY of the bottomless pit (his sword or Cassiopeia alternately symbolized by a "Laconian KEY"; Messiah has "the KEYS of the grave and of death" -- Rev. 1:18; full moon is pit entrance) and a great chain in his hand (Medusa's head; Milky Way) (20:1). And he laid hold on the dragon (Drago), that old serpent (Serpens), which is the Devil (Hydra), and Satan (Cetus), and bound him (in Pisces; just as the Azazel goat was bound and carried away "by the hand of a fit man" on Yom Kippur -- Lev. 16:20-21; cp. Isa. 24:21-22) a thousand years (360 + 360 = 720 + 280 = 1000 from Cetus [April 16th] to Gemini [June 20th])(20:2), And cast him into the bottomless pit (full-moon pit; "unto a land not inhabited" -- Lev. 16:22), and shut him up (as it waned to a new moon), and set a SEAL upon him (Solar eclipse SEAL disk attached to the neck of Cetus as part of deleavening ritual on Days of Unleavened Bread since six months after Yom Kippur), that he should deceive the nations no more, till the thousand years should be fulfilled (cp. Rev. 12:9): and after that he must be loosed a little season (20:3). Sunday is the first day of the week. Saturday is the seventh day of the week. To be consistent with this Millennial rest, Christians need to rest on Saturday rather than Sunday. Bible chronology indicates Adam and Even were created approximately 4000 B.C. Man has been given the first 6000 YEARS to do what he pleases. But the seventh period of 1000 YEARS is God's MILLENIUM. This teaching can be found in the Slavic version of the Book of Enoch 33:1-2 ; Talmud Sanhedrin 97a; Avodah Zarah 9a; Epistle of Barnabas 13:4 as well as Psalm 90:4, 2 Peter 3:8, Revelation 20:1-7 and Hebrews 4:1-11. The first SIX MONTHS of the sacred calendar contain only THREE holy days. But in the SEVENTH MONTH the remaining FOUR holy days all come together. This tells us that MAJOR EVENTS CRESCENDO in the MILLENIUM. SOLOMON, the prince of peace, in his wisdom, wealth and glory was a shadow of the MESSIAH to come. SIX STEPS (six thousand years) led to his THRONE (the millenium) (2 Chr.9:17-19). Both Solomon and Christ are wise, wealthy KINGS and SONS of DAVID who build a wonderful TEMPLE and create an era of PEACE. Solomon had 1000 wives from around the WORLD which typifies the true church, composed of Jewish Christians from around the WORLD, married to Christ. Jesus went to the WEDDING in Cana on the seventh day SABBATH. The first four days are found in John 1:19, 29, 35 and 43. On the fourth day he TAKES a TRIP, and is not seen again until the seventh day in chapter 2 (John 2:3). Yes, after 4000 YEARS, Christ TOOK A TRIP to earth, but we won't see him again till the end of 6000 YEARS when he has his WEDDING. Noah was 600 YEARS old when the FLOOD came (Gen.7:6). Then "in the 601st year, in the first month, the first day of the month, the waters were dried up ... and Noah removed the covering of the ark" (Gen.8:13 ). Christ said "There are some standing here, who shall not taste of death, till they see the Son of man coming in his kingdom" (Matt.16:28). Then, "AFTER SIX DAYS Jesus taketh Peter, James, and John, his brother, and bringeth them up into an high MOUNTAIN (kingdom -- Dan.2:35,44-45) privately, and was TRANSFIGURED before them; and his face did shine like the sun, and his raiment was as white as the light. And, behold, there appeared unto them Moses and Elijah talking with him" (Matt.17:1-3). Again, we read about JOASH the HEIR to the throne of Judah being "hidden in the house of the Eternal SIX YEARS ... And the SEVENTH YEAR Jehoiada sent and fetched the rulers over hundreds, with the captains and the guard, and brought them to him into the house of the Eternal, and made a covenant with them ... And he brought forth the king's son, and put the crown upon him" (2 Kings 11:3,4,12). Even with all this evidence, some have suggested that the Millenium is not literal but symbolic. However, the scale of a day for a year (Nu. 14:34; Ez. 4:6) only applies to the "seven times" in which it operates. With the close of that era, the necessity for concealment by use of a cypher disappears. This is a literal 1000-year Sabbath. Not forever in heaven playing harps. But 1000 years on earth (rev. 5:10) administering church and state affairs. And I saw thrones (Cepheus & Coma; 12 lunar phases), and they sat upon them (12 apostles sit in 12 thrones also -- Matt. 19:28; 1 Cor. 6:2), and judgment was given unto them: and I saw the souls of them that were beheaded (Argo's lion head and man face, Taurus cut in half, Medusa's head held by Perseus, Orion's Lion head, & Pegasus cut in half) for the witness of Jesus, and for the word of God, and which had not worshipped the beast (Hydra-Leo-Ursa Major-Ursa Minor; Holy Roman Empire -- Dan. 7), neither his image (Capricorn; Moslem goat -- Dan.8), neither had received his mark (star; cross; "in name of Allah") upon their foreheads, or in their hands; and they lived and reigned with Christ a thousand years (These March-to-July constellations cluster near Aries; "he that loseth his life for my sake shall find it" -- Matt. 10:39; "If we suffer, we shall also reign" -- 2 Tim. 2:12) (20:4). (But the rest of the dead, fall-winter constellations, lived not again until the thousand years were finished.) This is the first resurrection (20:5). Blessed and holy is he that hath part in the first resurrection: on such the second death hath no power, but they shall be priests of God and of Christ (Rev. 5:10; 1 Pet. 2:9), and shall reign with him a thousand years (20:6). God said to Israel, "If ye will obey my voice ... ye shall be unto me a kingdom of priests" (Ex. 19:5-6). The "saints shall judge the world" (1 Cor.6:2). Saints will be "kings and priests" and "reign on the earth" (Rev. 5:10). These saints are "a royal priesthood" (1 Pet. 2:9) The twelve apostles will sit on twelve thrones (Matt. 19:28). Here we see that "he that loseth his life for my sake shall find it" (Matt. 10:39). "If we suffer, we shall also reign with him" (2 Tim. 2:12). Verse 5 should have parentheses around it from "But" to "finished." There are two resurrections. Those who qualify will be resurrected to immortal life at the end of this 6000 YEARS (1 Cor.15:23). This is "a better resurrection" (Heb. 11:35) -- "the resurrection of the just" (Luke 14:14). "For the time is come that judgment must begin at the house of God" (1 Pet.4:17; Rom.8:14). Then the "saints shall judge the world" for 1000 years (1 Cor.6:2). ALL THE REST of humanity who have lived and died without ever knowing the plan of salvation (Matt.10:14-15; 11:21-25; 12:41-42) will be resurrected back to physical life (Ez.37:1-14) AFTER the Millenium (Rev.20:5; Isa. 65:20). They will also be "JUDGED every man according to their works" (Rev.20:13) and then resurrected or destroyed (Rev.20:15). As Christ said, "the hour is coming, in which all that are in the graves shall hear his voice, And shall come forth: they that have done good, unto THE RESURRECTION of LIFE (the first resurrection to immortality); and they that have done evil, unto THE RESURRECTION of DAMNATION (lit. "judgment") (the resurrection to mortality)" (John 5:28-29). In Revelation 20:4-6 we read that John "saw the souls of them that were beheaded for the witness of Jesus, and for the word of God, and who had not worshipped the beast ... and they lived and reigned with Christ a thousand years. (But the REST OF THE DEAD lived not again until the THOUSAND YEARS WERE FINISHED.) This is the FIRST RESURRECTION. Blessed and holy is he that hath part in the FIRST RESURRECTION; on such the second death hath no power." Again we see TWO RESURRECTIONS one thousand years apart. The first to IMMORTALITY and the second to MORTALITY. "And many of those who sleep in the dust of the earth shall awake, some to EVERLASTING LIFE (first resurrection after 6000 years) and some to shame and EVERLASTING CONTEMPT" (second resurrection after 7000 years)" (Dan.12:2). Yes, "in Christ shall all be made alive; But every man in his own order: Christ the first fruits; afterward they that are Christ's at his coming (FIRST RESURRECTION to IMMORTALITY). Then cometh the end, when he shall have delivered up the kingdom of God, even the Father, when he shall have put down all rule and all authority and power (RESURRECTION to MORTALITY). For he must reign, till he hath put all enemies under his feet. The last enemy that shall be destroyed is death" (1 Cor.15:22-26). Jesus the Messiah "shall judge the quick (living) and the dead at his appearing (FIRST RESURRECTION to IMMORTALITY) and his kingdom" (SECOND RESURRECTION to MORTALITY) (2 Tim.4:1). "For we must all appear before the judgment seat of Christ, that everyone may receive the things done in his body, according to that he hath done, whether it be good or bad." In the Millenium, humans will live out a full life of "an hundred years" before dying (Isa.65:20). War will end (Isa. 2:4). "All shall know the Lord, from the least even to the greatest" (Jer. 31:34). Carnivorous and poisonous animals (as well as men) will become vegetarians and harmless (Isa. 11:6-9; 65:25) just as originally at creation (Gen. 1:29-31) and before the flood (Gen. 9:3). Whenever men "turn to the right hand" or "turn to the left" they will "hear a word behind" them saying "This is the way, walk ye in it" (Isa. 30:21). And when the thousand years are expired, Satan shall be loosed out of his prison (rotate above the horizon) (20:7), And shall go out to deceive the nations which are in the four quarters of the earth, Gog (Castor), and Magog (Pollux), to gather them together to battle: the number of whom is as the sand of the sea (Milky Way army or stars of heaven) (20:8). And they went up on the breadth of the earth, and compassed the camp of the saints about (Zodiac rotates around Ursa Minor), and the beloved city (Arab Khan cer [Cancer] means "Place of Holding"or Cattlefold for the two asses -- Israel and Judah -- Gen. 49:14): and fire came down from God out of heaven (Milky Way), and devoured them (sun in Gemini -- 360 + 360 + 280 = 1000 from Cetus to Gemini) (20:9). And the devil that deceived them was cast into the lake of fire and brimstone (Sun in Cetus at sunset; Satan cast onto the Sun), where the beast (Hydra-Leo-Ursa Major-Ursa Minor) and the false prophet (Capricorn) are (were cast), and shall be tormented day and night for ever and ever (20:10). And I saw a great white throne (crescent under Aries), and him that sat on it (Aries; also Cepheus; "The Father judgeth no man, but hath committed all judgment unto the Son" [John 5:22; Acts 17:31; Rom. 2:16]), from whose face the earth and the heaven fled away (as it rotated 360 degrees); and there was found no place for them (so they stayed in the same place) (20:11). And I saw the dead, small (Ursa Minor; Canis Minor) and great (Ursa Major; Canis Major), stand before God (Cepheus); and the books (of the Bible -- John 5:45 -- on round DVDs) were OPENED (to their understanding -- Isa.25:7) (lunar phases): and another book was OPENED, which is the book of life (Ex. 32:32-33; Dan. 12:1; Luke 10:20) (full moon in Virgo on round DVD): and the dead were judged out of those things which were written in the books (of the Bible -- "the word that I have spoken [the Bible], the same shall judge him in the last day" -- John 12:48), according to their works (Ten books symbolize ten commandments; the "Book of Remembrance," another book OPENED, records our good and evil deeds -- Isa. 65:6; Ps. 56:3; Mal. 3:16)(20:12). And the sea gave up the dead which were in it; and death and hell (black new moon) delivered up the dead which were in them (constellations rotating above the sea and land horizon): and they were judged every man according to their works (20:13). True Christians do not come before this throne. They already have eternal life. With immortality, the dying process is stopped (v.14). "The last enemy that shall be destroyed is death" (1 Cor. 15:26). And death and hell (Gr. "hades" -- grave; black new moon) were cast into the lake of fire (sun eclipse). This is the second death (20:14). And whosoever was not found written in the book of life (full moon) was cast into the lake of fire (solar eclipse pit) (20:15). The Lamb looks away as evildoers are thrown into this fire, perhaps implying "I never knew you" (Matt. 7:23). The honor of executing evil tyrants belongs to the saints (Ps. 149:9; Dan. 7:22). The sun's apparent rotation is now counter-clockwise indicating a POLE SHIFT. Isaiah 24:1 says, "Behold the Lord maketh the earth empty, and maketh it waste, and turneth it UPSIDE DOWN, and scattereth abroad the inhabitants thereof" (cp. Isa. 29:16). "The earth is moved exceedingly. The earth shall reel to and fro like a drunkard, and shall be removed like a booth" (24:19). Herodotus (c. 484 BC – c. 425 BC) records that since Egypt became a kingdom, "four times in this period (so they told me) the sun rose contrary to his wont; twice he rose where he now sets, and twice he set where he now rises." (Book 2:142). Pomponius Mela, a Latin author of the first century, wrote: "The Egyptians pride themselves on being the most ancient people in the world. In their authentic annals ... one may read that since they have been in existence, the course of the stars has changed direction four times , and that the sun has set twice in that part of the sky where it rises today." (Pomponius Mela De Situ Orbis i.9.8.) The Magical Papyrus Harris speaks of a cosmic upheaval of fire and water when "the south became north, and the earth turns over." (H.O. Lange, "Der Magische Papyrus Harris," (1927), p.58). In the Papyrus Ipuwer 2:8 it is similarly stated that "the land turns round [over] as does a potter's wheel and the "Earth turned upside down." This papyrus also mentions the terrible devastation caused by this upheaval of nature. In the Ermitage Papyrus (Leningrad, 1116b recto) also, reference is made to a catastrophe that turned the "land upside down; happens that which never (yet) had happened." (Gardiner, Journal of Egyptian Archaeology, I (1914); Cambridge Ancient History, I, 346). Plato wrote in Politicus, p.49: "At certain periods the universe has its present circular motion, and at other periods it revolves in the reverse direction. There is at that time great destruction of animals in general, and only a small part of the human race survives." According to Sophocles, "Zeus ... changed the course of the sun, causing it to rise in the east and not in the west" (Fragments of Sophocles III, 5, fragment 738). Caius Julius Solinus, a Latin author of the third century, wrote of the people living on the southern borders of Egypt: "The inhabitants of this country say that they have it from their ancestors that the sun now sets where it formerly rose." (Solinus, Polyhistor, xxxii) "The Chinese say that it is only since a new order of things has come about that the stars move from east to west." (Bellamy, Moons, Myths and Man, p.69). The Eskimos of Greenland told missionaries that in an ancient time the earth turned over and the people who lived then became antipodes." (Olrik, Ragnarok, p.407). In Tractate Sanhedrin 108b it says, "Seven days before the deluge, the Holy One changed the primeval order and the sun rose in the west and set in the east." The Koran speaks of the Lord "of two easts and of two wests" (Koran Sura LV). When a thunderbolt strikes a magnet, it reverses the poles of the magnet. The globe is a huge magnet. A short circuit between it and another celestial body could result in the north and south magnetic poles of the earth exchanging places. Planet X (brown dwarf bigger than Jupiter -- a.k.a. Nibiru) has a 3,600-year orbit according to the ancient Sumerians. As it flies by, it will eclipse the sun making it dark, and make the moon appear red since Nibiru is a red planet and would reflect on the moon. Also it would pull stars behind it causing stars to fall from heaven. As Planet X approaches its closest point to the sun, a violent cosmic duel will occur, lasting many months. Earth will be slammed by numerous perfect solar storms, cosmic lightning and deadly radiation. Volcanoes will erupt. Seas will boil. Planet X will fly by the earth on 26 March 2016 according to Gill Broussard. Its node points are 150 days apart where it crosses earth's orbital plane. Comets, asteroids, sink holes, earthquakes, methane gas release killing sea creatures, 100-pound hailstones, tidal waves and coastal flooding will all result from the encounter.